First, the plot of the game Ice King is planning to seduce as many princesses as possible. And it is Finn and Jake’s duty to warn the other princesses to have them take measures to prevent the evil of the Ice King. And when you mention the name of the game, you can imagine how the game is playing. Yes, you have to fly. 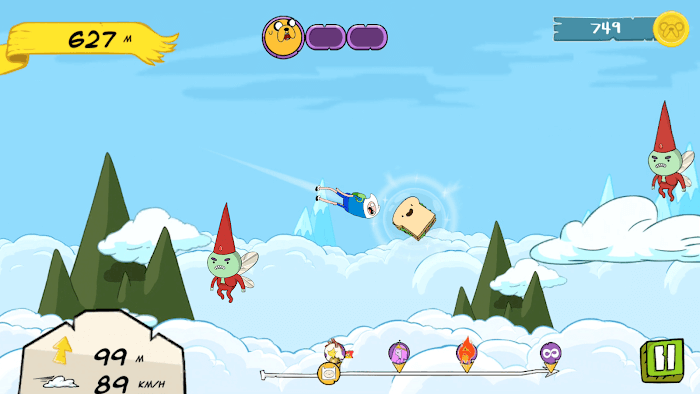 You must fly each princess’s castle to warn them of the threat that comes from the Ice King. 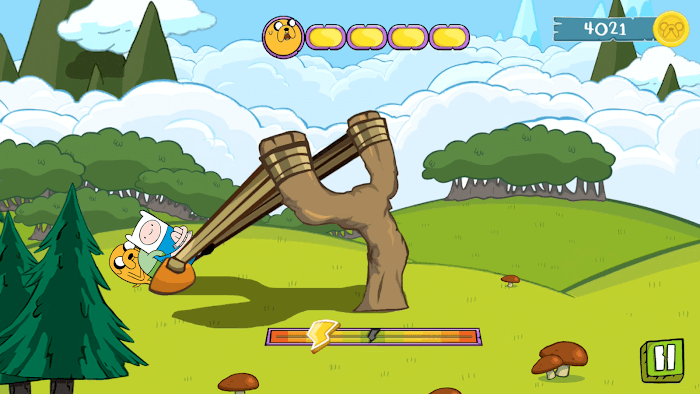 Secondly, on how to play, you use a giant catapult to launch Finn and Jake to anywhere around the land of OOO. When you play, there will be height adjustment and the power of the launcher. 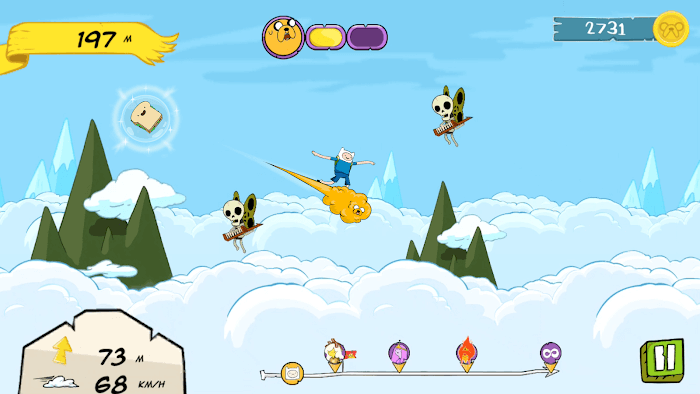 This affects the way to the castle as well as you are before the Ice King to save the princess or not. The higher you fly, the more money you get. Money is an essential part of helping you upgrade your launch pad to make sure you can fly and rescue the princesses in time for the Ice King. In addition to the money in the game, there is always a system that uses real money to upgrade your character. Think carefully before spending real money on any item in the store. And above all, there are always obstacles in the sky preventing you from coming to the princess. So to avoid the shortened distance, you must make sure that you do not touch any challenges on the way. Third, the game graphics, games loyalty to the drama of the same name. When playing the game, you will definitely feel close. 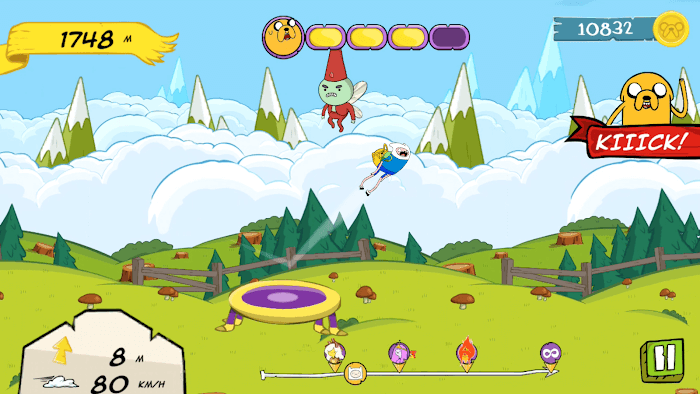 This helps you live in the Adventure Time universe. Maybe this is why you can love this game. And about game information, the game is only 39MB. Wow, is not it? You do not have to worry that there is not enough space for this game or fear of interruption during gameplay. This game is straightforward but it gives you a lot of fun and comfort. You can play it anywhere anytime. I am confident that it will help you entertain after hours of study and work stress. Through the introduction, you have seen a certain part of the game as well as the appeal of this game. It is not simple but less attractive. Is not! It will make you happy soon. Please download and enjoy it right away. Have a nice time playing the game.